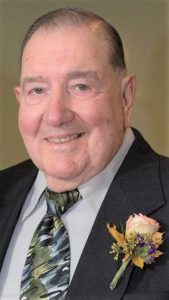 A funeral mass was celebrated on Saturday, August 18th at St. Anthony of Padua Church, Revere for Anthony F. Genovese, Jr., who died unexpectedly on Monday, August 13th at the Cape Cod Hospital of Hyannis. Entombment followed the funeral mass at Woodlawn Community Mausoleum, Everett in the Sheffield Building. Born & raised in Revere he attended Revere Schools & was an alumnus of Revere High School, Class of 1949. “Tony” entered the Air Force during the Korean Conflict on March 5, 1951 & served thru March 4, 1955 being discharged with the rank of Staff Sgt. His entire working career was in the field of electronic (industrial) sales. He worked for and managed for a number of electronic specialists, Samsung, LG, Mitre Corp., Terradyne, etc. For the past two years, he re-entered the work force at “Yarmouth Seafood & Café in Hyannis as a short-order cook–chef … specializing in soups & chowders. Anyone who knew “Tony”, was aware of his reputation as a fabulous cook to the level of “Chef”. He is the beloved husband of 25 years to Cynthia (Hale) Genovese & the late Loretta A. (Scotch) Genovese. Cherished father to Deborah A. “Debbie” Forth & husband Daniel of Islip Terrace, NY & Joseph A. Genovese & wife Rosa of Navarre, FL. Devoted grandfather of Robert A. Genovese & wife Danielle of Milton, FL, Vanessa M. Porten & husband Mark of Navarre, FL, Deanna M. Miller of Manhattan, NY & Desiree L. Fitzgerald & husband Shaun of Methuen. Dear brother of Dolores DiCologero & husband Michael of Revere. Adored great-grandfather to Chace & Catalina Porten, Jake A. Genovese & Corey. “Tony” is the stepfather of Richard E. Bennett & wife Cheryl of FL, W. Cameron Bennett & wife Barbara of MA, Cherie A. Wiberg & husband Douglas of Middleton, Scott H. Bennett & wife Christine of Wilmington, Jeffrey W. Bennett & wife Betty of Chelmsford & Gregory S. Bennett of Brewster. He is also lovingly survived by 6 step-grandchildren. Late Air Force Veteran of Korea. Saturday, August 18th from 9:00 a.m. to 10:30 a.m.